One of the projects I did this past fall finally launched this weekend and i’m really excited about how it turned out. Working as senior concept for the digital media agency Scholz & Volkmer, I provided UX consulting and information architecture for the Bayer 04 Leverkusen Heimspiel iPhone and Android App for the Bayer 04 Leverkusen Fußball (soccer) Team. The team was having a problem with wireless connectivity in their stadium. As a result, the fans were missing out on a lot of game related mobile and social experiences. The Heimspeil app was created to provide registered fans free wifi connectivity while in the stadium network. Via the app’s timeline based UI, they could experience realtime game updates, stats, streaming video and participate in polls and other social activities. The result was a more rich & engaging experience for the fans as well as a more focussed marketing and communication platform for the team and stadium. Congrats to a great team who worked really hard and did an awesome job! 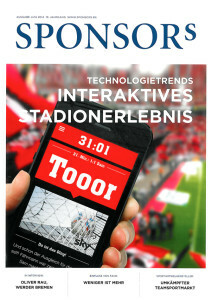 The App was featured in the June 2014 Issue of Sponsors Magazine, a leading German-language producer and provider of information in the sports business industry. The project I was working on for the last year and a half is FINALLY LIVE! My “technical title” was Senior Information Architect for Crytek’s new social network called GFACE. It is hard to describe all the roles and responsibilities I had on this project because I wore so many hats that covered so many touch points. I can honestly say that I have never put so much effort and personal blood, sweat, tears and great ideas into a project as with this one. I am really proud to have worked with such a talented team and I am really happy that it is now live. The service is now in Closed Beta release. Check it out! Via my position at Fjord Berlin, I worked on-site at Nokia Gate 5 as a Senior Interaction Designer. The scope of the project was to develop the user interface and wireframe specifications for the next generation of Nokia Ovi Maps 3, which is currently in beta release and both align it across multiple devices, mobile and web, according to the Symbian S60 touch and scroll and click framework requirements as well as act as a UI coordinator and consultant for multiple sub teams, product owners, UX managers, visual designers and developers. The project began with various brainstorming sessions, whiteboarding and paper prototyping, followed by a functioning UI for one target device, flash prototypes were built and usablity studies were conducted. The project was then approved and pushed forward though a staged, agile SCRUM development process to include more devices and features. It was quite an extensive project and a great introduction to working with mobile touch screen devices, navigation systems and map based social services. From 2005 to 2007 I worked as a Senior Marketing Manager, Graphic Designer and Art Directior for Cingular / AT&T Mobile Browser Division, developing content deliverables for wireless (WAP) applications, print and web marketing material and assets for 3rd party content providers. The main focus was to developing and publishing content for the MEdia Net WAP portal. It was quite an interesting position to be developing web graphics for mobile phones, which, at that time had never been done before, so every project was an experimental journey in to the unknown. Lots of trial and error, user testing and optimization to squeeze a much pay content as possible into a multitude of very unpredictable WAP browsers. When Cingular wireless merged over to AT&T, I was responsible for rebranding of the MEdia Net and Cingular Video mobile portals. The goal was not only to rebrand, but to optimize the experience by removing unnecessary graphics to increasing speed and load time. It was actually pretty challenging finding an “AT&T Blue” that was true to the brand and worked across all handsets and screen resolutions without looking either too baby blue or purple. MEdia Net had several mini portals for promoting various sports & entertainment brands. Above: NCAA Final Four – March Madness, World Cup Soccer 2006, and Winter Olympics 2006 sports portals. Below Pussycat Dolls, Daddy Yankee & Chris Brown. A laminated, in store customer tutorial manual for the MEdia Net portal.